Spatula, fork, basting brush, bottle opener, & cork screw. Packed in a white gift box. Promote your brand using useful items! 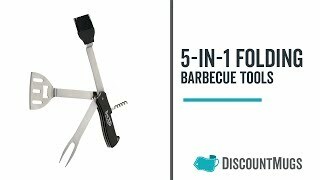 Choose these Personalized 5 in 1 Folding BBQ Tools on your upcoming event and you'll never go wrong. Featuring its folding characteristics that goes with spatula, fork, basting brush, bottle opener, & cork screw. All these perks in one awesome promotional item! Each folding BBQ tool is packed in a white gift box. Personalize these Personalized 5 in 1 Folding BBQ Tools by placing your logo or message you want. Make things easier by choosing a font or clip-art from our Online Design Tool that you could use for your design. You can also upload your ready made designs. In case you don't have any ideas yet, we have our customer assistants to help you in designing them. What are you waiting for? Add these items to your shopping cart today and get the lowest price in the market!